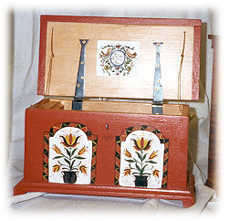 Miniature Pennsylvania German Dower Chest  early 18th century brought over to this country by German immigrants. 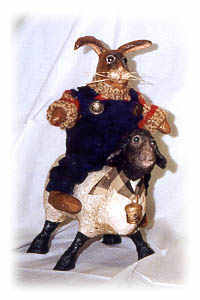 Folk Art Rabbit riding on a Sheep  Sculpted from a papier-mache mixture dating from the first century AD in China. 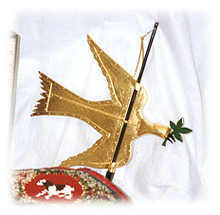 "Dove of Peace" Weathervane  This is a ¼ scale replica of the "Dove of Peace," George Washington's weathervane from Mount Vernon. The original was custom made for him in Philadelphia in 1787 and he specified that the bird carry in its beak an olive branch painted green. The original is no longer on Mount Vernon but in a museum. 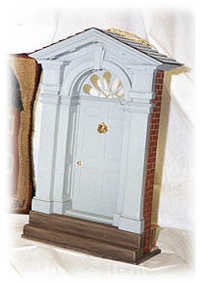 Doorway replicated from the entry of the Amstel House circa 1730 in New Castle, DE in the location of Penn's Landing  home of two and birthplace of three signers of the Declaration of Independence. Mt. Vernon Cupolo with Doves  Miniature punchneedle design created with one strand of embroidery floss and a miniature punchneedle. Very old art form  a series of approximately 1200 individual loops and stitches per square inch. Blown-out Goose egg dyed with yellow onion skins scratch-carved in the PA Dutch Moravian Style (c. 1810-1830). Egg depicts Buzz Aldrin on the moon, July 20, 1969. 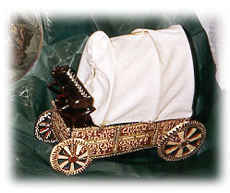 Wild West covered wagon was designed as a historical reminder of the hardships that our forefathers endured while exploring the west in a covered wagon. 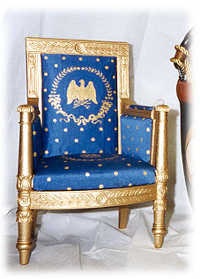 Miniature of the Bellange bergertes chair found in the Blue Room. Hand-carved in cherry and hand-painted with gold leaf paint. Revolutionary War Eagle became a popular motif for furniture. 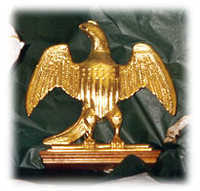 This eagle is based on a finial that decorated an 1800 Baltimore Secretary. 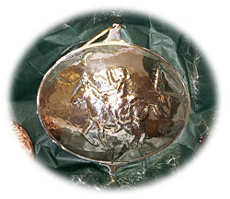 Sterling Silver piece depicting Massachusetts silversmith Paul Revere on his ride alerting his countrymen of the approach of the British army.